Forgive me for not posting in a couple of days. I've been "on the road" teaching in our graduate program. As you can see in the brief autobiography on the right, I served for twenty-two years in the United States Navy, and I'm very proud of that service. Today I received an e-mail from a man I knew in the Navy, although I haven't seen him in many years. His e-mail was troubling, to say the least. See, the subject of his e-mail was "Can Muslems Be Good Americans?" I would normally consign such trash to the cyber-dumpster without reading it. Still, I went ahead and waded through it. What was going through my mind was the Kennedy-Nixon campaign when I was ten years old. 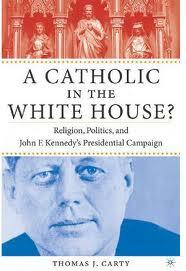 "Can a Catholic be President" was the question back then, although the only reason that it had traction at all was because some people still asked the even more fundamental question: "Can Catholics Be Good Americans?" Those who would answer that question negatively proposed some of the same kind of nonsense that I read in today's e-mail. The question is: How best to deal with this kind of ignorant, mis-informed and hateful attitude? The teacher as well as the deacon in me wants to explain the errors in this e-mail (which I realize has been around ever since the LAST Presidential campaign), but that might give it more attention than it warrants, and only serve to perpetuate it further. I realize that this is not a posting directly related to the diaconate, but in another sense it certainly is. The perpetuation of this kind of religious intolerance needs to be addressed, and addressed with honesty and truth. I'm not sure that Americans are hateful or ignorant or some other insulting negative for being worried about the growth of Islam in the United States and what some Moslems want to do to our country. I just heard two experts on Islam (former Moslems themselves) interviewed (who did not sound hateful, but rather academic) on the radio and they agreed that many American Moslems (not just radicals or terrorist types) want Sharia law in the U.S. instead of our Constitution (but many will not admit it they said). Just because we Catholics weren't really trying to get the pope to move the Vatican to America, as bigots would have it, doesn't mean that some other immigrant group might not come along really wanting to mangle our legal system. To say NEVER could happen is to be part ostrich. I read of a group religious protest against the Koran burning (which burning I also oppose)which included Koranic readings in a Catholic cathedral in California. According to the news article clergy of all types were there--Catholic, Episcopal Methodist, even Druids (all Western). But it struck me that in what was supposedly a complete list of who was there--there was not a single clergyman from any Christian Church whose roots were in the Middle East. No Maronites, No Eastern Orthodox, No Coptics, No Armenians, No Chaldeans, No Assyrians. Yet the West Coast has many such churches. As one person said--They have suffered too much from Islam recently and in the past to be as complacent as Americans seem to have become. They should read the book: "It Can't Happen Here." But, of course, we Western Christians pay more attention to anyone, except the witness of Eastern Christians. As one scholar said on the radio, until Western Christians learn the word "abrogate" they will never really understand Islam or the Koran. "Abrogate" is the term that is used in regard to later writings in the Koran superceding earlier parts of the Koran on the same topics. They said that the peaceful (constantly quoted in the West) parts of the Koran were written before Jews and Christians started refusing Mohammed's demands that they convert to his new religion. After that, they claimed, Mohammed's tolerance went downhill--fast--(even to the personal ordering of the genocide of a Jewish tribe.) Chilling passages were then added to the Koran. Thus, according to the Moslem rule of abrogation, it is the chilling intolerant passages that are now operative. And according to the scholars it is these later passages that are mainstream orthodox Islamic doctrine, though a FEW try to water it down. It is the reverse of how the New Testament's "turn the other cheek," etc. teachings are operative over the Old Testament's "eye for an eye." It is the embracing of these later passages that acount for the favorite refrain "Death To (Fill-In-Blank)" of so many Moslem crowds (including against other Moslems in Islamic countries and in demonstrations in the West). The problem that I have is this: The e-mail I received had nothing of the reasoned approach of your comment. Rather, it consisted of short, one-line disclaimers about Islam, most of which were absolutely inaccurate (the meaning of the word "Allah", for example). The goal of the piece was NOT education or even persuasion. It was designed for one purpose, as far as I could tell, and that purpose was to engender both fear, and then an emotional reaction to that fear. Certainly we should have intelligent conversations about the nature and growth of Islam and the current state of affairs. I'm not politically or militarily naive. But the kind of material I'm referring to is not something that anyone should take seriously or with any kind of credibility. I guess what I'm saying is that I'm concerned here with the demagoguery employed and its own appeal to fear and violence.